CSCW 2015 will take place at the Westin Bayshore hotel in beautiful and vibrant Vancouver, BC, Canada. The conference is co-located with Learning at Scale (L@S). Greater Vancouver lies along the west coast of Canada where the Pacific Ocean meets the majestic mountains. With a population of over 2 million people, Greater Vancouver is known as one of the most ethnically diverse cities in Canada and has been ranked as one of the most liveable cities in the world based on quality of life. 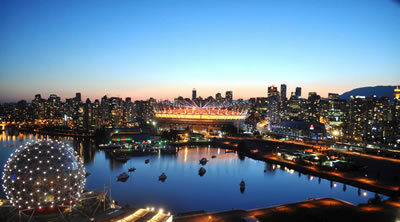 Vancouver was host to the 2010 Winter Olympics and the 2010 Winter Paralympics amongst other events, and will be hosting the finals of the 2015 FIFA Women's World Cup. Downtown Vancouver contains an abundance of fine dining, ethnic cuisine (more sushi than you can eat! ), outdoor ice skating, bicycling (yes, even in March! ), and one of the largest urban parks in North America. Stanley Park covers 1,001 acres (404.9 hectares) of land and contains hiking trails, the Vancouver Aquarium, and the 22km Seawall which is perfect for walking, cycling, or running. Vancouver is one of the warmest cities in Canada and March should see a mix of sun, cloud, and rain with average temperatures ranging from 3 to 10 degrees Celsius (37 to 50 Fahrenheit). Do you ski or snowboard? Vancouver is a short drive from Whistler, Grouse Mountain, Cypress Mountain, and other outdoor winter destinations.